Liberal MP Andrew Leslie, the parliamentary secretary to the foreign affairs minister, stood in the House of Commons today to table the motion that officially endorses the findings of a UN fact finding mission that concluded that crimes against humanity have been committed against the Rohingya Muslims and other ethnic minorities. Foreign Affairs Minister Chrystia Freeland — speaking in Washington, where she is engaged in NAFTA negotiations — thanked all parties in the House of Commons for voting in favour of the motion. "That's a very important statement by Canada, the Canadian Parliament and I want to start by noting that," she said, before "thanking all the members of the House for their hard work on this absolutely tragic issue, on this atrocity." 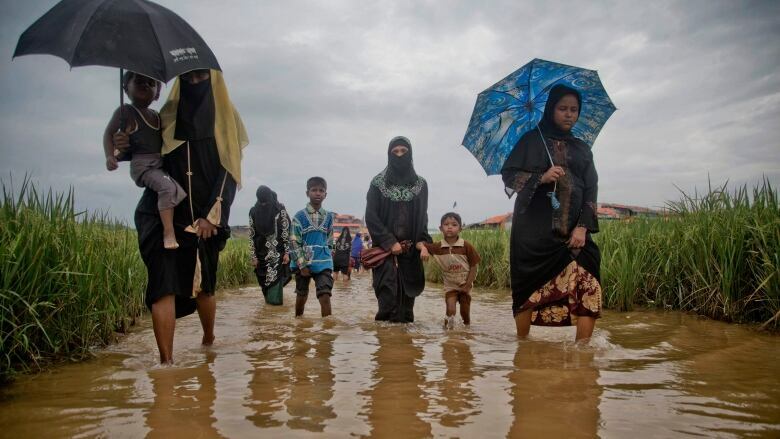 Fareed Khan, a spokesman for the Rohingya Human Rights Network, called the development "wonderful" news, but said the government must take steps to make the motion meaningful. He said the government should begin a process to charge Myanmar's de facto leader, Aung San Suu Kyi, and military leaders under Canadian and international law using the principle of universal jurisdiction, which allows for individuals to be charged with international crimes such as genocide. Khan said that after the passage of this motion, the Liberal government no longer has an "excuse" to avoid stripping Suu Kyi of her honourary Canadian citizenship. "It's totally incongruous. You can't have someone hold that kind of honour along with people like Malala Yousafzai, the Dalai Lama and the Aga Khan and then have that person also complicit in genocide," he said. "It's like giving the key to the city to a mass murderer. It does not compute, and the government needs to revoke that honour and work with other nations to try and move forward on the legal front internationally to make sure those who committed the crimes, and who were complicit in the crimes, are charged and held accountable." The UN report names six military commanders in Myanmar who should be investigated for genocide in Rakhine state and crimes against humanity in other areas, calling their actions "shocking for their horrifying nature and ubiquity." "Many of these violations undoubtedly amount to the gravest crimes under international law," it read. The report also condemns Suu Kyi for failing to use her power or moral authority to stem or prevent the unfolding events and meet her responsibility to protect the civilian population. Instead, civilian authorities have spread false narratives, allowed hate speech to flourish and blocked independent investigations, the report says.